Sage ‘Icterina' (Salvia officinalis 'Icterina'): growing, planting, caring. An evergreen dwarf cultivar with variegated with yellow and pale green foliage. 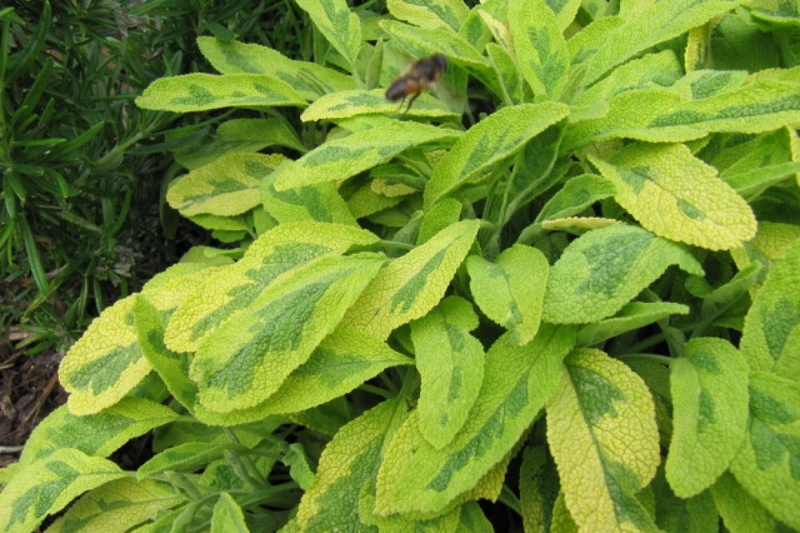 Sage is happy in direct sunlight or partially shaded, in light, humus-rich soil that's cool and well drained. It can be used to treat coughs, in tea, as well as in the kitchen. There are many cultivars of different habits and color. Sage is a plant species from the Lamiaceae family. This subshrub plant has an raised habit with hairy evergreen leaves. The flowering takes place in June in terminal clusters composed of numerous small (1-2 cm) blue-lilac flowers. The leaves, 5 to 8 cm long, are oval or spear-shaped, oblong, indented, embossed, and gray-green. The base of the stems are often reddish. Plant common sage in ordinary soil - even poor or rather chalky - as long as it is well-drained. This plant tolerates some drought. It doesn't like heavy or soaked soils which can hinder its hardiness in winter. Plant it exposed to the sun or in semi shade. Prepare the soil with some light digging (to decompact without necessarily turning it over with a pitchfork or broadfork), hoeing, and raking. Plant leaving 1 m between the plants. Tamp the soil down well so that the roots are not in contact with air, then water generously. If potted, plant in a fibrous compost or light soil, providing a container with a diameter of at least 40 cm. Place the pot in a lighted area.